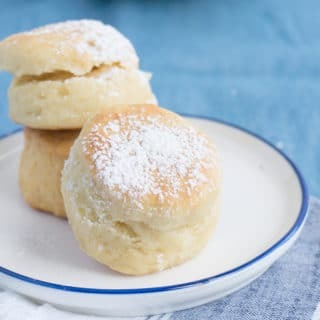 These easy biscuits are soft and fluffy. The recipe makes a lot of these mini rolls, but you can freeze them as well! Dissolve the yeast and sugar in the warm water in a small bowl. Set aside for about 10 minutes. Whisk 5 cups of self-rising flour, baking soda and salt in a large bowl. Break the shortening and butter into pieces and toss with flour. Work in the flour by rubbing your fingers together as if you’re snapping your fingers until it looks like crumbly feta cheese. Make a well in the center of the flour. Stir the yeast mixture into the buttermilk and pour the mixture into the hollow center. Stir it with a wooden spoon pulling flour in from the sides, until a shaggy, slightly damp dough remains. Flour a working surface and turn the dough out. Knead with floured hands, folding it in half and pushing it out, continuing until it’s nice and soft to the touch. About 10 minutes. You can choose 3 options to proceed with from here: 1) roll, cut + bake the biscuits, 2) cover dough in a well oiled bowl and let the dough rise for a lighter biscuit or 3) store the dough in the fridge and use as needed, within a week. In my video, I cut the dough in half – 1 to bake immediately and 1 for the rest of the week. If you refrigerate the dough, bring to room temp before baking. When ready to use, divide the dough in half. Roll out into a ½” thick rectangle. Fold again and roll out to 1” thick. You’ll eventually repeat this with the 2nd half as well. Dust your biscuit cutter in flour, cut biscuits without twisting the cutter. Move to a greased baking sheet and let double at room temp – 30 to 40 minutes. A good place is in the oven with the oven light turned on to keep it slightly warm. Sometimes my oven light makes it too warm, so make sure to check on it. After the biscuits have risen, preheat oven to 400F. Bake biscuits on the middle rack for 10-12 min, rotating halfway through, until golden brown. If the bottoms start to brown too fast, you can slide another baking sheet underneath the current one as added protection. Remove from oven, brush with melted butter. You have the option to dust them with powdered sugar (as Angel Dust). Or for a little twist, brush with butter and sprinkle with a spicy mix (for Devilish Dust). Angel biscuits can be frozen, but should be baked first, then frozen. They reheat just perfectly. Adapted from Southern Biscuits by Nathalie Dupree and Cynthia Graubart. Self Rising Flour: Sift together: 1 cup all purpose flour, ¾ tsp salt and 1½ tsp baking powder.